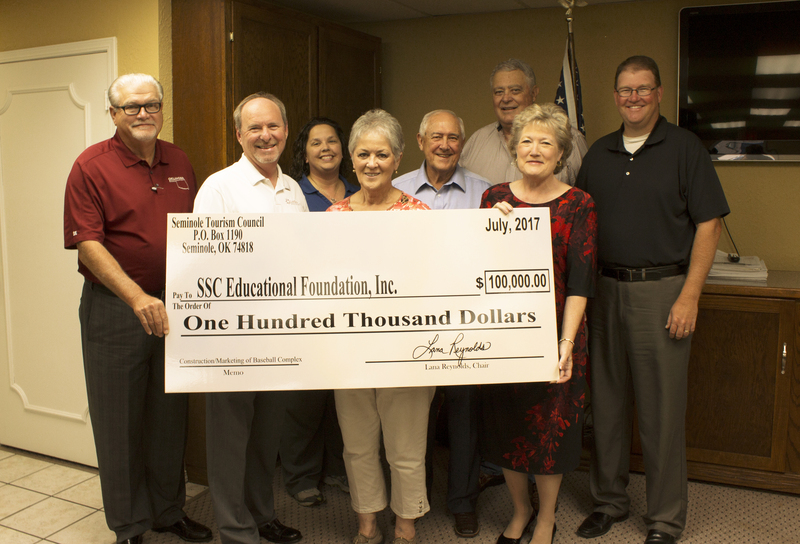 The Seminole Tourism Council has committed $100,000 over a two-year period for the construction and promotion of a new Baseball complex being planned at Seminole State College. Funding for the project is being conducted through the SSC Educational Foundation. The Tourism Council oversees funds collected from city lodging taxes to be used for encouraging and promoting visitor and tourism events, conventions, conferences and other attractions in Seminole. Pictured (left to right) are SSC Rural Business and Resources Director Larry Smith, Seminole City Manager Steve Saxon, Chamber of Commerce Director Amy Britt, Tourism Council Secretary Marci Donaho, Chamber of Commerce President Doyle Long, Tourism Council member Neil Craig, Tourism Council Chair Lana Reynolds and Chair of the SSC Educational Foundation Jeramy Rich.